180 gram gatefold album with download code. ‘Little Fictions’ was recorded in Scotland and Manchester and sees the band collaborate with the string players of The Hallé Orchestra, the Hallé Ancoats Community Choir, members of London Contemporary Voices and session drummer Alex Reeves. As with the previous three elbow albums it was produced by Craig Potter. 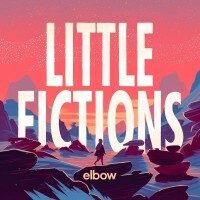 ‘Little Fictions’ is emphatically a band album. Having written individually for its chart-topping predecessor, ‘The Take Off and Landing of Everything’, sessions this time were collective affairs, with all four members gathered initially in a house in Scotland before moving to Guy’s attic in Prestwich and finalising recordings in the familiar setting of Blueprint studios, Salford. The departure of drummer Richard Jupp prior to commencing the writing and recording process in earnest saw early sessions characterised by new approaches to rhythm, with the band utilising percussive noises, sampling and loops to build tracks. The grooves that run through much of the album, from the go-go beats of ‘Gentle Storm’ through the jagged trip hop of ‘Kindling’ to the soulful ‘Firebrand & Angel’ represent both the band’s widest musical palette and a newfound sense of experimentation borne from both necessity and desire. That desire fuelled the title track, an eight minute piece that is epic without at any point feeling excessive. As a shorthand for the album it is perfect, crossing musical genres and experimenting with sound in ways that demonstrate the confidence and enthusiasm of the band throughout the recording process. Andy says: It's ironic that with the exit of their drummer comes Elbow's grooviest album . Guy Garvey's care-worn observations are perfectly suited to this kind of gently propulsive, shifting dynamic. Another great album, folks.